HomeDigital ComicsDark Horse Digital: B.P.R.D. Sale! Dark Horse Digital: B.P.R.D. Sale! 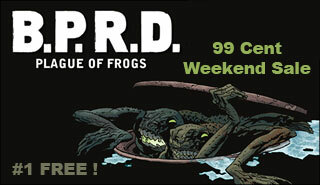 Dark Horse Digital have their sale on this weekend and its a Plague of Frogs! This weekend’s sale features stories from theÂ B.P.R.D. Plague of Frogs saga! Get theÂ Plague of Frogs, Hollow Earth, andÂ The Soul of Venice issues for only 99 cents starting Friday morning. If you’re not reading this Dark Horse Horror classic, you’re missing out.